Oh dear. Where to begin with the film, Rascals. Sometimes the level that our writers go to recreate a hit can be baffling. 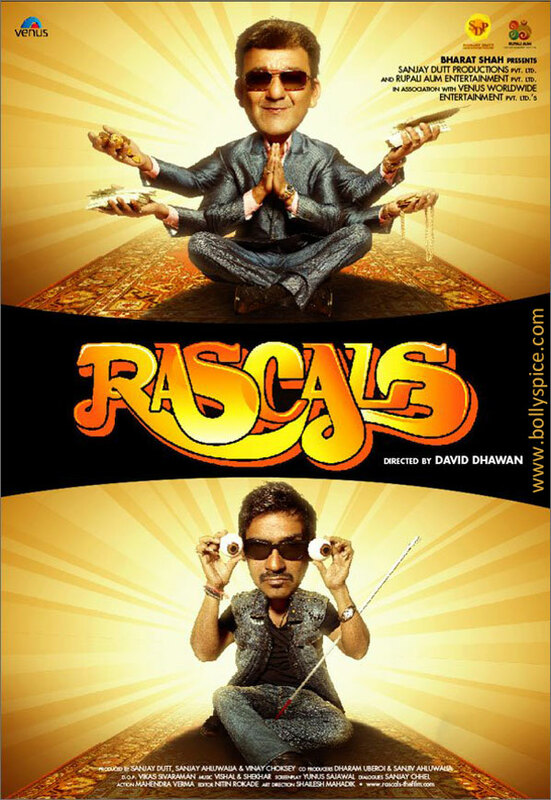 Ok, so we have the amazingly talented Ajay Devgn and Sanjay Dutt as the Rascals in question. And yes you are expected to leave your brain at home but this is nowhere near what you would expect from them or director David Dhawan. This is one of those films that regardless of what or whom you see on screen, your brain and possibly your whole being will object. Expecting a comprehensive story would be naive but it isn’t too much to ask for some funny and innovative proceedings, is it? Apparently so. So if you are prepared to take the plunge after seeing the trailer, there really isn’t much more to it. Bhagat Bhosle [Ajay Devgn] and Chetan Chohan [Sanjay Dutt] are your typical con men that incidentally pull one of the same guy, Anthony Gonsalves [Arjun Rampal] on the same day. To escape him, they both fly out to Bangkok where they meet. Now instead of becoming comrades, the two become instant rivals as they try to out-con each other for the major prize. To marry the rich, well-settled and beautiful multimillion dollar heiress, Khushi [Kangna Ranaut] for her money. Unfortunately for us, what was supposed to be a gag fest of one-upmanship turns into a lame excuse to recreate some classic slapstick comedy that Dhawan had created in the past. Literally the only thing is pleasing to the eyes is the cinematography by Vikas Sivaraman and the initial reels of cartoons. And that’s about it. Right from when the two leading men are introduced and the location of Bangkok is established, it comes crashing down like a pack of cards. Seriously speaking Ajay and Sanjay have their hearts in the right place but neither stood a chance up against the ridiculous writing. Ajay’s blind major act may have been plausible enough to accept but what the writers were thinking when they wrote Sanjay’s “social worker/swamiji” type act, it beyond this writer. Arjun Rampal is also sincere in his attempt and while he is probably one of the more serious characters in the film, he doesn’t get much to do. Kangna has the role of being the ditsy billionaire that flaunts her assets [pun intended]. Not really a role that requires in depth acting or precision. But even then, she hams more than SPAM. Lisa Haydon has an amazing figure and clearly that was all that was required for her “role” of Dolly. Satish Kaushik is back on screen after a while but it is sad to see him wasted. Chunkey Pandey really needs to get better roles.